"The proposed Forestry and Land Management (Scotland) Bill is now being scrutinised by the Rural Economy and Connectivity Committee of the Scottish Parliament"
The Scottish Forestry Strategy’s stated aim is to make forestry a central part of Scotland’s culture, economy and environment, allowing people to benefit from Scotland’s trees, woodlands and forests. However, are the right policies and incentives in place to ensure their long-term management? 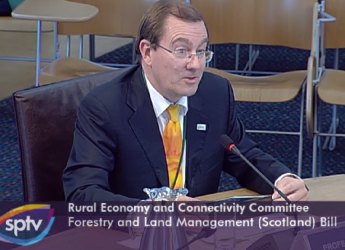 The question is at the centre of a proposed Forestry and Land Management (Scotland) Bill, which is now being scrutinised by the Rural Economy and Connectivity Committee of the Scottish Parliament, with support from the James Hutton Institute and other organisations. Professor David Miller, Knowledge Exchange Coordinator at the James Hutton Institute and SEFARI representative, took part in an evidence session with land owner stakeholders, forestry policy and environmental stakeholders, which is available to watch on Parliament TV video archives. The subject is contentious and generated a large amount of written evidence from a wide range of stakeholders. The proposed bill transfers the powers and duties of the Forestry Commissioners in Scotland to Scottish ministers. It provides Scottish ministers with a duty to promote sustainable forest management and publish a forestry strategy, and transfers responsibility for plant health to Scottish ministers so that responsibility for all plant health in Scotland will reside in one place. The bill also widens the provisions currently available for management of forestry land. It includes provisions on the management of land for sustainable development, and sets out provisions for compulsory purchase and the delegation of management functions to community bodies. Under the proposed legislation, the regulatory regime for felling trees is updated and becomes the responsibility of Scottish ministers and the Forestry Act 1967 is repealed for Scotland.